WASHINGTON – Some people are excited to attend a White House state dinner. Most would be thrilled to see their signature dish on the menu. 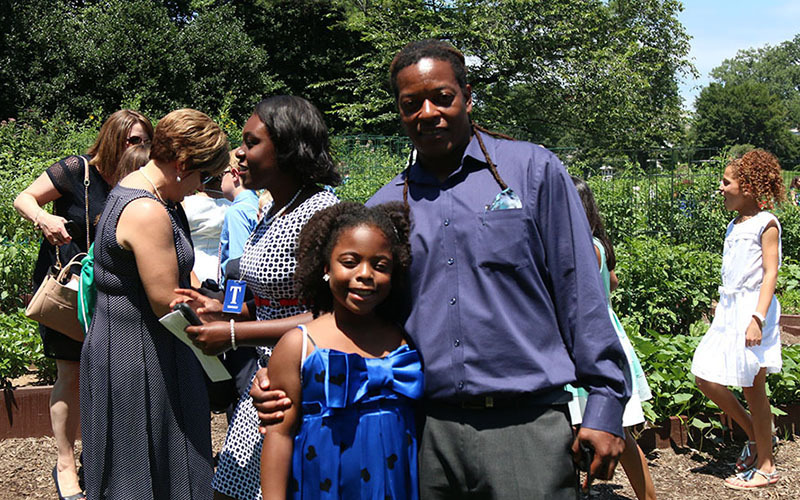 Not everyone tops off the day by skipping through the White House kitchen garden. But Nia Thomas is not everyone. 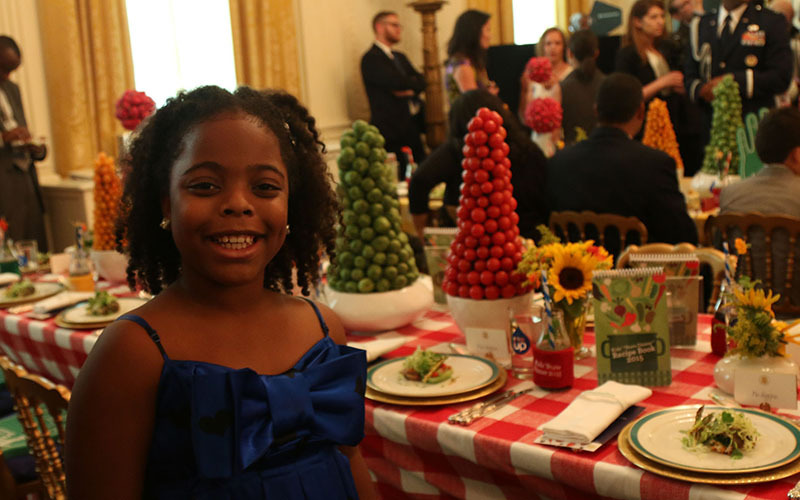 The 10-year-old Tucson girl was one of 55 grade-schoolers invited to the Kids’ State Dinner on Friday, an annual White House event for kid chefs from around the country who have come up with a healthy recipe. The avocado pistachio pesto recipe that won Tucson’s Nia Thomas a trip to the Kids’ State Dinner at the White House. For the pesto: In a blender or food processor, blend 1 cup water with all pesto ingredients except the pistachios. Add pistachios and blend until mostly smooth. Taste and adjust seasoning if needed. Set aside. For the “zoodles”: Use a grater, peeler, mandolin slicer, or spiralizer to turn the zucchini into zoodles. In a large bowl, mix zoodles with tomatoes, carrots and onion. Arrange the salad in bowls. Top with pesto and serve. Nia won an invitation for her “Oodles of Zoodles” dish, an avocado pistachio pesto. It not only got her to the White House, but it was one of six items that ended up on Friday’s menu from among the 55 recipes represented by the kids there. “I saw that my recipe was on the menu and that’s just like a huge thing for me,” said Nia, who clapped her hands over her mouth when the saw the menu card. 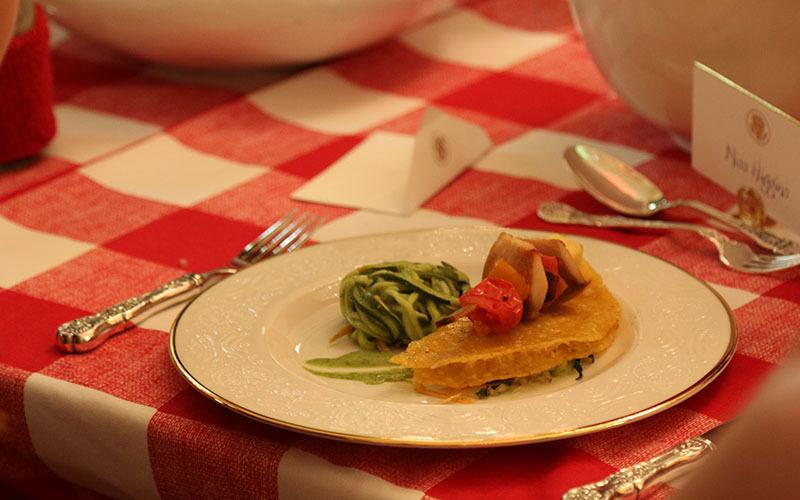 This was the fifth annual Healthy Lunchtime Challenge and Kids’ State Dinner, part of first lady Michelle Obama’s “Let’s Move” campaign to fight childhood obesity. The Kids’ State Dinner is also something of a family affair for the Thomases. 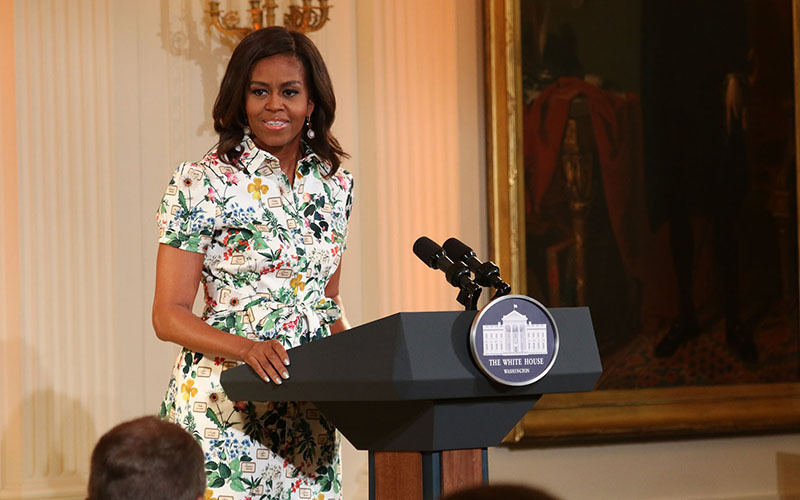 Nia’s older sister, Haile, won an invitation to the event in 2012, and has been back to the White House several times since. That’s not to say Nia was calm at Friday’s event. The giggly 10-year-old said her emotions included nerves, excitement and shock on setting foot in the White House for the first time. 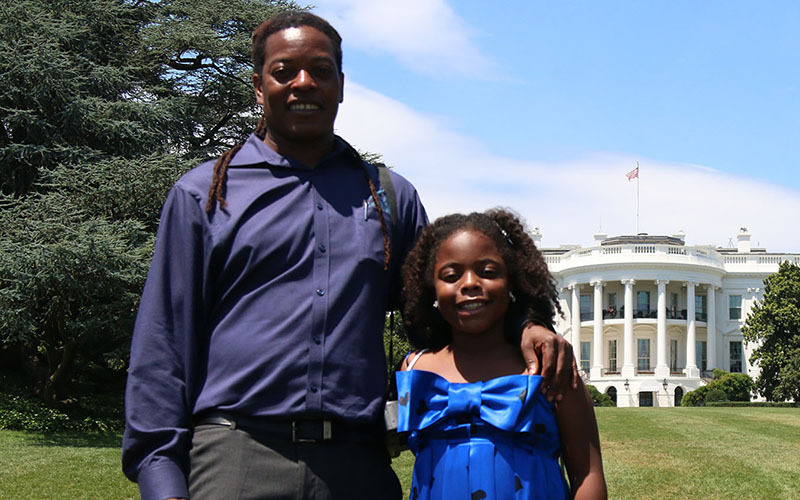 The visit was also the first for Nia’s father, Hugh Thomas, who agreed with his daughter that walking through the White House and getting to see certain rooms was an awesome experience and a great history lesson. Kids and their parents were seated at long, elaborately decorated tables in the State Dining Room. Each seat had a place card and each place had a formal setting, with the three courses served by white-uniformed waiters. 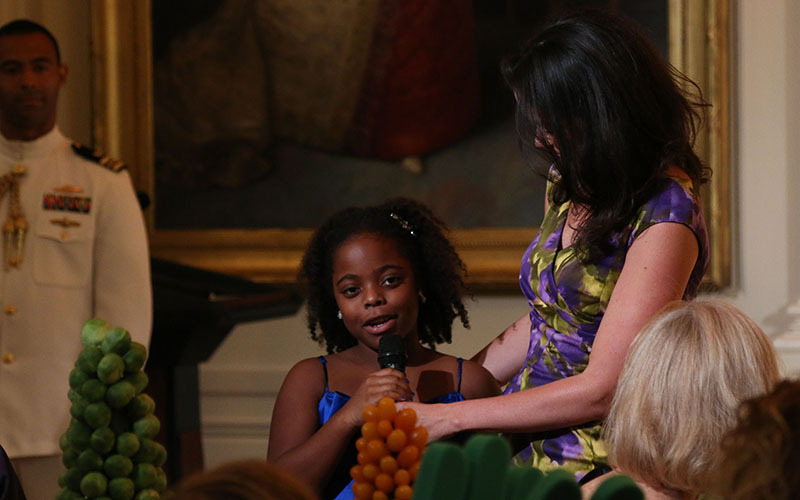 After the meal, of course, was the entertainment: The Broadway cast of Disney’s “Aladdin” performed and led the kids and their parents – and the first lady – through several rounds of singing. The highlight of the dinner for Nia was the surprise appearance of President Barack Obama. “You guys are setting a great example for all your friends in school and in the neighborhoods, and we’re really proud of you for that,” the president said, before shaking hands all around, including Nia’s. Mrs. Obama told the kids that “with hard work, perseverance and a well-balanced diet,” they could achieve anything. Then she sent them off on a tour of the kitchen garden, but not before repeating her message that they should spread the news of a healthy diet to their friends. Haile Thomas has been spreading that gospel for several years now, and her latest effort is the Happy Organization, a website the features a picture of her and Nia prominently on the home page. “They really believe in what they’re doing,” Hugh Thomas said of his daughters, who he said are drawn to community activities. He said the family has always liked to cook, but began cooking healthy after he was diagnosed with type-2 diabetes. At that point, they shifted from just cooking to really knowing what’s in their food, and the family has since shifted to a vegan diet, he said. That passion for food and for cooking can mean “it’s a total war in the kitchen” at times, he said. But Nia took time out Friday “to say thank you, to my mom and sister” for their help in the kitchen as she refined the recipe that won her an invitation to the Kids’ State Dinner.